At a press conference last month, renowned home audio brand Sonos made a big deal out of how its sound bar with built-in Alexa is going to change smart speakers and sound bars forever. But weeks before Sonos launched the Beam, a smaller audio company named Polk scooped it with an Alexa-powered sound bar of its own. It’s called the Polk Command Bar, and we’ve been living with it for the last few weeks. 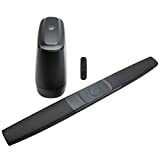 It’s an undeniably Echo-inspired sound bar, with the signature blue LED ring from an Echo in the middle of the sound bar, surrounding the controls. At heart, it’s much like other mid-range sound bars, with good sound, a wirelessly connected subwoofer, and a pair of HDMI inputs. There’s also a slot behind the bar for one of Amazon’s Fire TV dongles, although it won’t fit some of the newer Fire TV hardware. The first job of a sound bar absolutely has to be sound, and luckily, the Command Bar doesn’t fall short. Polk made the most of the Command Bar’s size, which incidentally is a little bigger than a lot of comparable sound bars, at 43 inches long and about four inches deep. It sits well on top of a credenza or dresser (which I’d say is how Polk intends for it to live), but there’s also wall-mounting hardware that I made use of. The tweeters are positioned at either end of the sound bar, with the larger drivers in the middle facing the audience. The result is a sound stage that feels about as immersive as you can expect from a sound bar without any surround speakers, especially since it can process surround-sound audio. The bass is provided by a separate wireless subwoofer, which scores points for looking more interesting than most of the other generic black-box subwoofers. Pairing is done wirelessly and it comes from the factory already set up, so you just have to plug the sub into power to get things working. As you’d expect, you can adjust the sound virtually infinitely using the included remote. The Command Bar’s default settings favor speech over music, which I think is the right approach for a TV sound bar. However, it would be good if Polk included a software setting that could toggle the equaliser when you stream music over Spotify. Thankfully, you can also change the audio settings through Alexa just by talking to the sound bar, which makes things more straightforward. The Alexa integration is really what sets this sound bar apart from other (equally excellent) Wi-Fi connected sound bars. There’s really two questions that I think need answering: Is the Command Bar’s job as a TV sound bar made any better by integrating Alexa; and can an Alexa-powered sound bar serve as a replacement for a dedicated smart speaker like Amazon’s own Echo? The answer to those questions is yes, and maybe. Having lived with other sound bars before, I’d say the inclusion of Alexa makes things better, for one simple reason: fewer remotes. I hate having different remotes littering up my coffee table, and including Alexa in the Command Bar means that I rarely (if ever) have to reach for the dedicated Polk remote. You can switch HDMI inputs and adjust the sound all by using Alexa, and that’s 90% of what I ever want to do with a remote. Assuming that you have a relatively modern TV, you can adjust the volume up and down using the TV remote, and by using Alexa for most of the sound bar commands, you can keep that Polk remote hidden away. That, in my mind, is a big win. Having the Command Bar serve as a replacement for an Echo or Google Home really depends on the layout of your house and how you want to use your smart assistant. I didn’t find the voice recognition from across my room as good on the Command Bar as on my Google Home, or other Alexa-integrated devices I have at home. It works well from the couch, but particularly if you have music already playing, telling Alexa to set a timer or turn a light on doesn’t work consistently. That doesn’t mean the Command Bar is useless as a smart speaker — far from it. It just means that if you have one large open-plan kitchen and living room, and your TV (and sound bar) isn’t directly in the center of that, you’re going to need to invest in an extra Echo Dot or a second smart speaker. The regular Echo speakers are all small enough that you have some choice about where you position them; putting your Echo inside a sound bar means that it’s going to invariably be wherever your TV already lives. Overall, I’d say that putting Alexa in any sound bar will make it better. The way that Polk has deeply integrated Alexa functionality into the sound bar’s controls particularly enhances its utility as a sound bar, and makes it a more efficient part of your living room set up. You can find better-sounding sound bars for the money — $299 buys a whole lot of speaker these days — and you can find much smaller smart speakers for a fraction of the price. But $299 is right in the middle of the higher-end sound bar range, and it’s a full $100 cheaper than the only real competitor, the Sonos Beam.